Dubai, UAE, November 06, 2018: In this remarkable Year of Zayed, and to honor the 100th Birth Anniversary of the late Sheikh Zayed Bin Sultan Al Nahyan, the Founding Father of UAE, Dubai Youth Olympic School of Rhythmic Gymnastics, in partnership with Al Habtoor Group and Dubai Duty Free, are delighted to announce the 1st Emarat National Rhythmic Gymnastics Championship 2018, which will be held at the Al Habtoor Tennis Academy in Al Habtoor City, Dubai, on November 16, 2018. 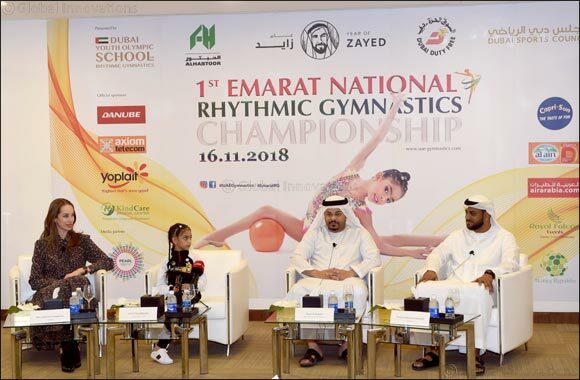 Being held under the aegis of Dubai Sports Council, the Emarat National Rhythmic Gymnastics Championship is the first of its kind championship to be held in the UAE with nearly 200 athletes from local sports clubs, public and private schools taking a part. One of the youngest and most successful Emirati gymnast in the history of the UAE, Lamia Tariq Malallah, will be the face of the campaign for the 1st Emarat National Rhythmic Gymnastics Championship 2018 and she will be representing Dubai Youth Olympic School in the event. With the support of the Dubai Sports Council, the tournament is set to showcase the impact of female sports and values of women empowerment, and further promote this elegant discipline of rhythmic gymnastics and raise awareness about the sport among children and women in the UAE. “We are really pleased to add the National Rhythmic Gymnastics Championships to Dubai’s sports calendar,” said Ghazi Al Madani, Acting Director of Dubai Sports Council’s Sports Events Department, at Tuesday’s press conference to announce the tournament. “Rhythmic Gymnastics is one of the most elegant form of sports and this championship fits firmly with Dubai Sports Council’s vision of promoting women’s sport, and encouraging and empowering women in sports. Ksenia Dzhalaganiya, a former member of the Russian national rhythmic gymnastics championship, is the brainchild behind the championships and its chief organiser. “Being a World and European champion and a former member of a Russian national team myself, it is my honor to present the 1st Emarat National Rhythmic Gymnastics Championship to the sports community in the UAE,” said Dzhalaganiya, who won gold at the 1999 European Championships in Budapest and the 2002 World Championships in New Orleans. Tariq Ali Abdallah Malallah, father of Lamia, added: “As part of the organising committee for the 1st Emarat National Rhythmic Gymnastics Championship, we are very grateful to HH Sheikh Hamdan Bin Mohammed Bin Rashid Al Maktoum for his continuous support and encouragement of sports among children and adults alike, irrespective of their age. As this will be an annual championship, Dubai Youth Olympic School has created a special award to honor Top three Emirati Sportswomen Of The Year for their inspiration and encouragement to the future generation. This year, the organisers will be awarding weightlifter Amna Al Haddad, fencer Alanoud Mabrouk Alsaadi and Amal Murad, who is the first Emirati woman to coach and compete in parkour or free-running. The Championship will see athletes in the age groups of 5 and 15 years old in action, with Gymnastics Clubs competing in the A and B Categories, and Schools participating in Category C.
A gala show prior to the awarding ceremony will showcase the beauty of rhythmic gymnastics. The routine will be prepared by local gymnastics clubs and schools. Officials of Dubai Sports Council, KHDA and UAE Athletic Federation will be present at the Awards Ceremony to honor the athletes by awarding medals and trophies to the winners of the 1st Emarat National Rhythmic Gymnastics Championship.